Gosainkunda Lake trek itinerary is the nearest beautiful trek to see the long Himalayan range and the beautiful lakes from Kathmandu. Gosainkunda Lake is the holy lake for both Hindu and Buddhist. Gosainkunda trek is one of the short trek in Nepal where you can have lots of real rural experience of Nepal. 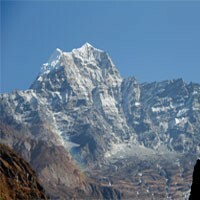 Gosainkunda lake trek itinerary and Gosainkunda frozen lake trek itinerary is the same itinerary. 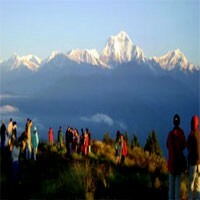 Remember us to organize and make the detailed itinerary of the Gosainkund lake trek itinerary for your best Nepal trek. Upon our arrival at the Kathmandu international airport, we will pick up by a representative from Frolic Adventure with private transportation and transfer to the hotel. We have the trip meeting in our hotel with a manager from the company. Overnight at the hotel. Day 02 : Kathmandu full day city tour. After our breakfast at the hotel, we will be ready for our cultural heritage tour in Kathmandu. A knowledgeable tour guide takes us to four cultural sites with private car/van/bus and briefs about the sites and more. Today we visit Kathmandu Durbar Square, Monkey temple, Pashupatinath, and Bouddhanath than drive to the hotel and prepare and pack for the trek. Overnight at the hotel. Day 03 : Drive from Kathmandu to Dhunche(1960m. )6 hrs. We drive in the morning to Dhunche by the public bus. The bus stops for our early lunch in the local place and drives to Dhunche. Today our bus journey takes about 6 hours through hillside road. Dhunche is the district headquarter of Rasuwa where we spend of the first night of our trek. Overnight at the lodge. Day 04 : Trek from Dhunche to Thulo syabru(2250m. )6 hrs. We trek on the proper road about 2 hours until Bharkhu and ascend through the pine, rhododendron, chestnut, oak, and other trees forest about another 2 hours to Bharabal. We stop for our lunch here and see the apple orchid. we also can see the potato farms here and trek about another hour and a half to Thulo Syabru. Thulo Syafru is on the hill from where we see unblocked Himalayan range, valley, green hills, and much more. Overnight at the lodge. Day 05 : Trek from Thulo Syabru to Laurebinayak (3910m)6 hrs. Today, we have quite a long day ascending through pine and rhododendron forest with a great view and the sounds of the birds. We trek about three hours and reach to the little place, here we enjoy our lunch with the scenic view and trek another 2 hours through the forest to Cholangpati. After Cholangpati, we walk about 30 minutes and cross the tree line and reach Lauribinayak. 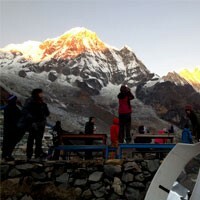 We see the sunset view with the very long range of the mountains including the Manaslu which 8157 meters. Overnight at the lodge. Day 06 : Trek from Laurebinayak to Gosainkunda (4380m. )3 hrs. We enjoy the morning sunrise view on the Himalayas and have our breakfast here than ascend to the little temple and stupa about half an hour. We see still attractive mountain range, valleys, villages, green hills, and much more from here than we trek on the easy trail after here. We see several holy lakes from this trail and reach to the most popular holy lake Gosaikunda. Overnight at the lodge. Day 07 : Hike to Lauribina la(Suryakunda)4610m. and trek to Chandanbari(3330m. )7 hrs. Today we have our breakfast early and hike about 2 and a half hour to the Lauribina Pass and visit some lakes and stunning mountain views. After the summit, we hike back to the lodge, pack our stuff and trek downwards to Chandanbari passing Lauribinayak. We may visit a small monastery and the cheese factory here. This is the area where we may have the chance to see the red pandas. Overnight at the lodge. Day 08 : Trek from Chandanbari to Dhunche(1960m.) 4 hours. We ascend steeply down for few hours to a small stream that coming from Gosainkunda and treks inside the forest following the stream. We pass the Himalayan mineral water factory before arriving Dhunche. Overnight at the lodge. Day 09 : Drive back to Kathmandu.Fare well dinner with Frolic Adventure. Today we drive back to Kathmandu by bus on the same road what we were on the first-day drive from Kathmandu. After our arrival in Kathmandu, we take a few hours rest of the long journey of the bus ride and be ready for the dinner which invited by Frolic Adventure. Overnight at the hotel. Day 10 : Departure to international airport for your final flight. Today we say goodbye to Nepal until our next visit. Frolic Adventure drops us with private transportation to the international airport for our final departure.